Not too long ago, I was talking about annotations in Analytics. 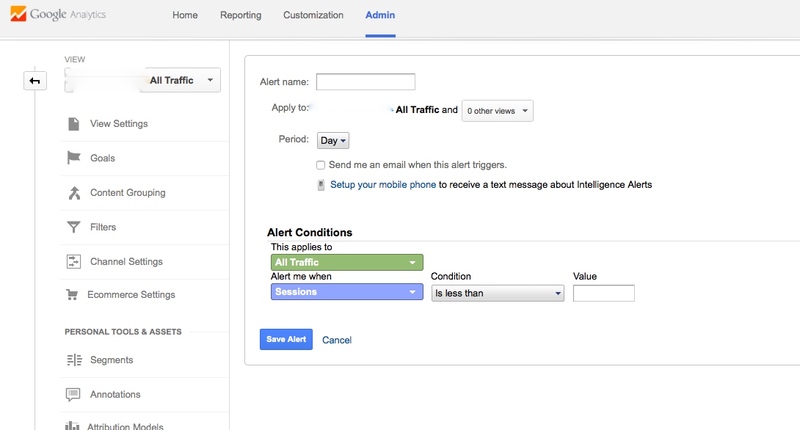 Today, I would like to discuss another underused tool offered by Analytics: Custom Alerts. Where annotations are useful to understand what has happened in your account that triggered a jump in traffic or a decrease in transactions, alerts tell you when to go have a look into your Analytics account because there might be something happening right now. Keeping an eye on an Analytics account is crucial, but usually digital marketers have several accounts to manage and monitor… and only 5 days per week! 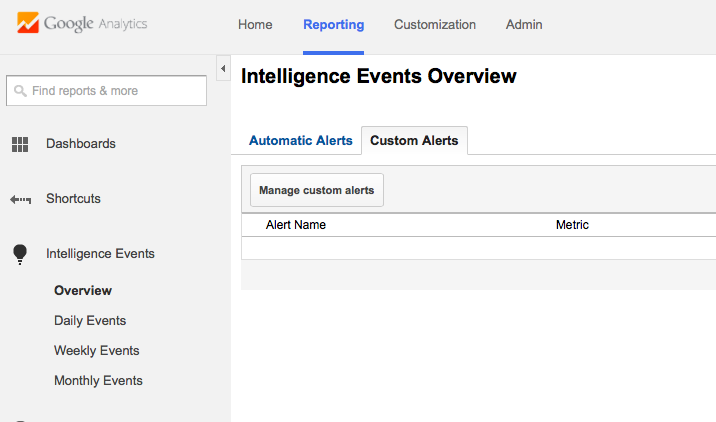 Thankfully, Analytics has Automatic alerts set up for you, under the Intelligence Events toolbar. But as we all know, it is always better to personalise the data and alerts we want to receive. This is where Custom Alerts become handy: if advertisers lack of time, then setting up those alerts can save some time and allow the advertisers to be notified in real time of any big changes in their account. Log into your Analytics account, go to the Intelligence Events section. Click on Manage custom alerts, then create an alert. It then takes you to the Admin tab where you can customise the alerts. What alerts should be set up? The number of alerts that advertisers can create is of course unlimited! Here is a list of the main alerts you can create to keep track of the major metrics in Analytics. If the number conversions is one of the top priorities of your business, then conversion tracking is absolutely essential in evaluating the performance of the account or website. No traffic on your website? Probably a business or advertiser’s worst nightmare! Thanks to this alert, you can be notified as soon as no traffic is recorded on your website. Because CPCs are a key metric for Adwords advertisers as they can trigger (or not!) the ads or cost you a lot of money, it is always a good idea to keep track of their evolution over time, especially if they suddenly rise. Note that the custom alerts should reflect the purpose and KPIs of your business. If your digital marketing strategy is to bring traffic to your website and increase Brand awareness, then keep an eye on the traffic and referral traffic. But if you are an e-commerce, then transactions and revenue are the 2 metrics to have in mind. Also, you can be notified of these alerts at the frequency you desire: on a daily, weekly or monthly basis. 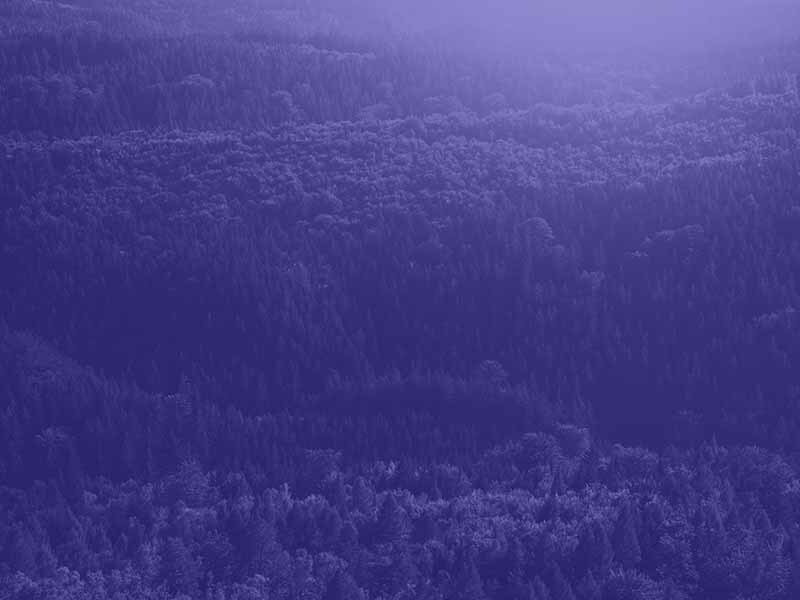 If you want ideas to help you get started with those, check this article, proposing more than 55 Custom Alerts, just need to pick which ones relate best to your business! As you can guess, the possibilities are endless, you just need not to be lazy and go and create those alerts! 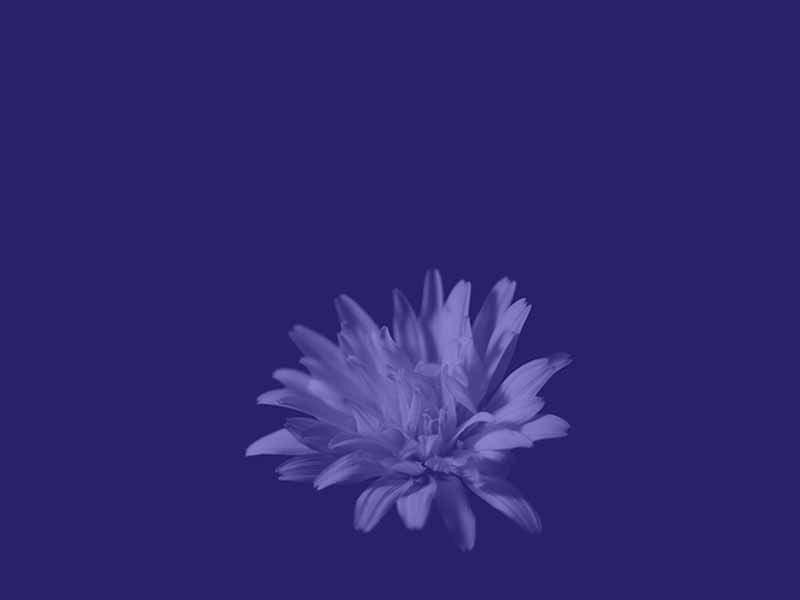 It will save you tons of time, motivate you to be pro active, and last but not least, your client will love you for noticing anything that might be going wrong with the website or performance! So spread the love, create alerts! Tell us in the comments below whether or no you’re using them, and if they helped you monitor your account!